Families sometimes feel that a printed order of service is helpful and provides a lasting memory of the funeral service. We are happy to organise these if required. If you wish to provide hospitality to the mourners, we can recommend catering services to provide the refreshments. We can provide name cards which can be completed by mourners to record their presence, or alternatively a person to be present at the church door to list the mourners as they arrive at the service. Flowers are traditionally the most silent but visible token of your emotion and respect. We are happy to arrange suitable flowers for you or arrange for a local florist to contact you to discuss your requirements. If donations to charity are requested in lieu of flowers we will accept and list donations on your behalf and forward them in due course to a charity of your choice. It is customary to place an announcement in the local or national newspaper. This serves two useful objectives, To make sure that anyone wishing to attend the funeral is able to, by informing relatives and friends of the appointed time and place. And secondly to reduce the chance of an embarrassing encounter with an uninformed friend or neighbour. Sometimes it is the wish of the deceased to be taken back to their country or place of origin, this is usually possible and we can advise you of the costs involved and the necessary documentation required. 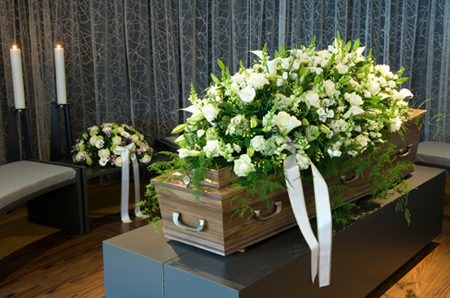 Alternatively, cremated remains can be sent to most parts of the World at relatively small cost.